The L. E. Cooke Co started in the 1950's searching for good varieties to introduce to the homeowners filling a need of varieties for mild winter area with flavor for retail nursery sales. From when Bob Ludekens started in 1946 up to the early '60's the main varieties sold were Elbertas, Hales, and Rio Oso Gem with the white flesh Babcock about the only low chill selection for retail sales. We had the same challenge with nectarines. Breeders in Florida, Louisiana, Texas, and California were developing varieties mostly for commercial use. L.E. Cooke Co became involved bringing them to retail sales for homeowner use. Peaches of Florida started crossing Springtime Peach a low chill white peach, and Tejon a low chill yellow. We grew both selections, but very small fruit. The L. E. Cooke Co. brought in Early Amber Peach - low chill yellow freestone with good flavor and a heavy fruit set. We still list it as a low chill Elberta type. We then brought in Rio Grande Peach, a Hale type, which is doing well in most mild winter areas. It has good flavored yellow freestone. Again this variety is currently listed in our catalog. To match Peaches of Florida, the Texas Agricultural Experiment Station introduced Earligrande Peach a good peach for the mild winter areas. A good companion with Early Amber. About the same time, Louisiana State University was seeking a mild winter peach that would handle their warm summer rains. Brown rot destroyed most of their peaches, a common problem in southern states. We added La Feliciana Peach to limit bacteriosis and brown rot. The L. E. Cooke Co has this variety in production for areas with summer rains and mild winters. Armstrong Nurseries in Southern California grew for their retail outlets and others. Like the L. E. Cooke Co they introduced finds as well as some of their own developments. In many cases a homeowner seedling find along the coast. 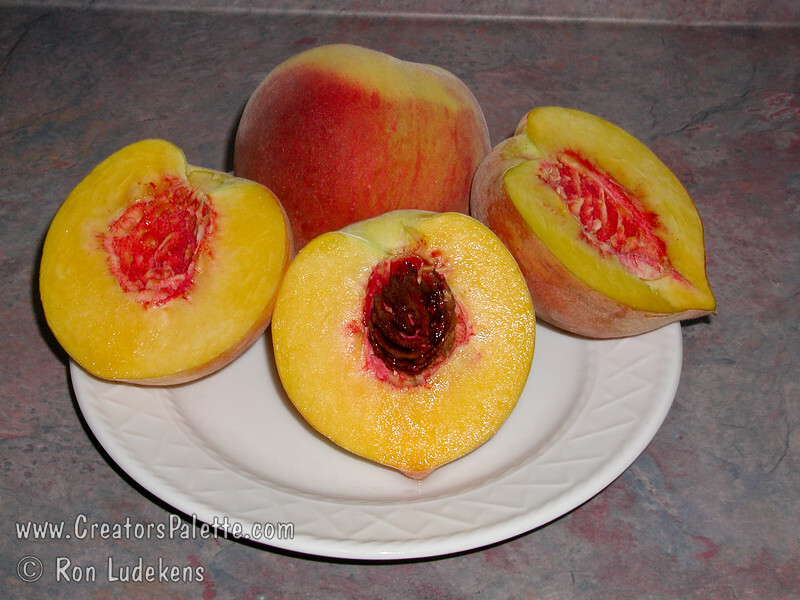 The two I like the most are Saturn Peach and Red Baron Peach both for mild winters - very colorful double flower and excellent quality fruit, freestone and yellow flesh. Both were introduced by David Armstrong. Descanso Nurseries also developed a series of peaches: 1Star, 2 Star, 3 Star, and 4 Star. The L. E. Cooke Co no longer grows these selections as new varieties have replaced them. Dr. Leslie at UC Riverside began developing many new varieties in the 1950-60's at the South Coast Field Station in Orange County. These became available to Orange County Nursery and the L. E. Cooke Co. Again these were hybridized for our climates in the mild winter southern areas. 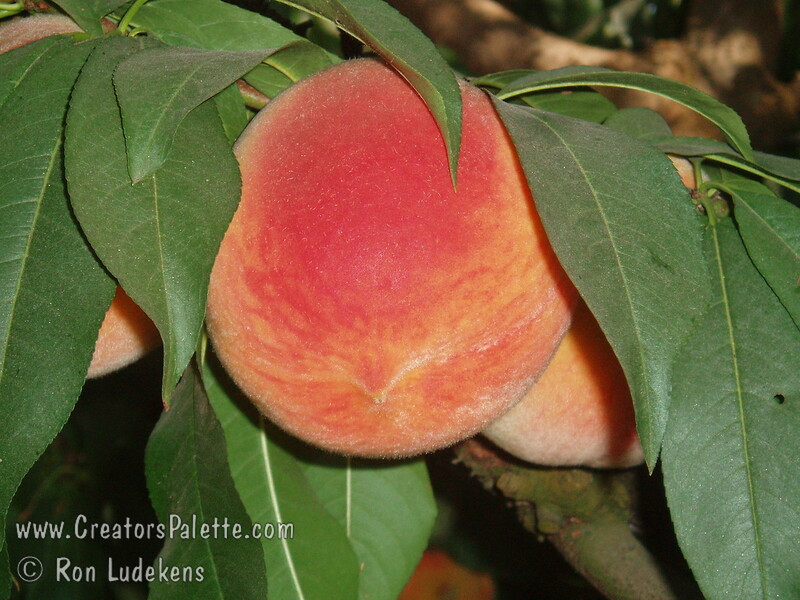 The L. E. Cooke Co still grows Bonita Peach, Rubidoux Peach, and Ventura Peach, and has discontinued Robin and Rochon. Later Flordaprince Peach a very mild winter peach was introduced in Gainesville, Florida by the Florida Research Station. This selection will fruit on the coast with very little chill. The L. E. Cooke Co.'s involvement with nurseries throughout the United States helped us become aware of other varieties which the company has named and introduced. These are listed on separate pages. As of 2014, we have six introductions with one being tested. This is a catch up blog from July - been traveling too much to keep up to date. Photo is of Lloyd Cassidy (Northern California Territory Manager) picking tree ripened peaches (and apricots and nectarines) to make home made peach ice cream for our office potluck. FYI - we only hire people who can cooke (pun intended). This budwood orchard is one of several around the nursery. Right next to the main office is the large Research Orchard where we can find fresh fruit from May through November. It is a nice extra perk for those of us who like fresh fruit. All combined, we have over 47 acres of budwood/scion wood orchards. There are over 26,000 records of trees, shrubs and vines that we individually track and maintain. This is a huge expense that we feel necessary to assure trees are true to name and where applicable, virus certified. Tomorrow I will follow up with a story about our Honduran interns' first experience with home made ice cream. For those of us in the U.S., the 4th of July is a special day. Besides the obvious historical significance, many look forward to this day for the special treats. 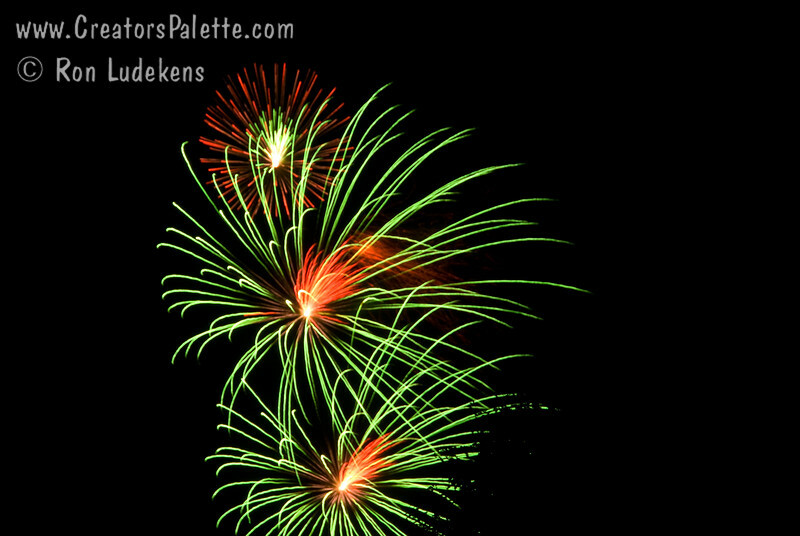 Kids love the fireworks (and parents worry about their shingle roofs). Hot dogs and home made ice cream are at the top of many favorites. I have one more special remembrance on this day and because of it look forward all year to the 4th of July. I had my first taste of Santa Barbara Peach on July 4th - the tree in the test orchard is just a few rows away from my parent's home. How can I describe it? Blogs are good for words and photos but not taste and smell. Think of the sweetest peach you have ever eaten combined with the overwhelming flavor of peach. A Babcock or Belle of Georgia peach combined with an Elberta or Rio Oso Gem. Melting in your mouth, dripping with sweetness and flavor. Admittedly, I like sweet things. Others, like my father, like tart fruit with strong flavor. The Santa Barbara Peach combines the best for both of us. This peach is for the homeowner to pick and eat fresh off the tree. It will never be a farmer's commercial success. When it is wonderfully ripe, it will soften quickly - think of a puddle of sweet juice on your counter top. It will not ship or store well. So don't make a pie from it. Instead, giggle with pleasure as you wipe the remaining dribbles from your chin. I hope you someday get a taste of this summer treat and you will forever look forward to its ripening date - which for our climate is around the 4th of July.